Travels in a Campervan: It's raining again! We’re at a lovely little family-run campsite in the village of Aios. It’s set on 3 grass terraces, all overlooking the sea and islands. This part of Spain is very much like Cornwall, craggy cliffs, sandy coves, deep inlets and estuaries and the wind….always the wind! It’s a really peaceful stop though and, at €10 per night including electricity, we plan to stay here for a few days; it’ll nice to put down roots for a while, chill out and get some walking and bike riding done….if the weather lets us. Speaking to the locals, they tell us it’s been the worst weather for March and April in 20 years - we can well believe it! After a sunny but windy day, it’s now raining heavily and is due to continue through the night until about midday tomorrow. We woke quite late for us - about 0900. It could be due to moving the clocks forward to Spanish time again, or it could have been the wine we drank last night! 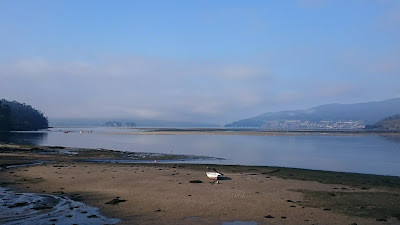 It was a beautiful, still morning; the tide was out and there was a light mist over the estuary and hills. A few of the local fishermen were out in small rowing boats, followed by an expectant flock of seagulls. We made a brew and sat on one of the benches by the water, soaking up the view. By the time we’d breakfasted and secured the van, we were the only ones left. I’d walked into town earlier to get some cash and we drove off to our next stop here in Aios. There’s a lovely family who run the site and live in their house right next to the beach. Their little dog came to say hello, then regularly checked up on us during the day, rewarded with a scratch behind his ears! We threw some bedding into the washing machine and once it was done, Cathy took great delight in hanging it out on their line to dry in the sea breeze. A couple of the Camino trails run past the site, following the coastal path north towards Santiago de Compostela. 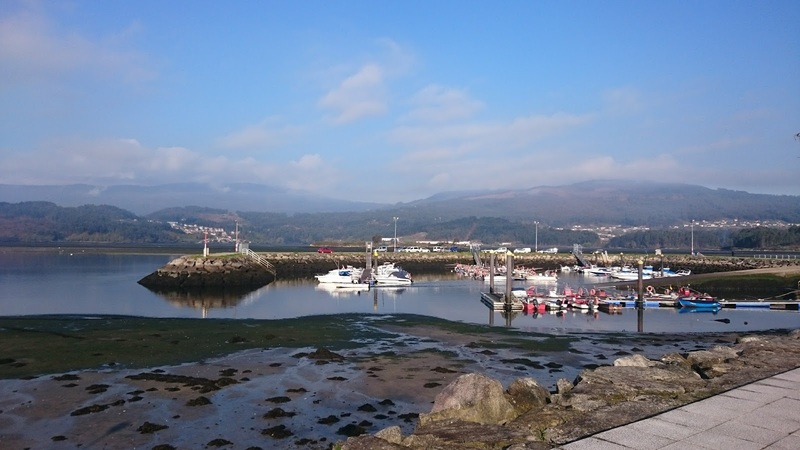 On our coastal walk this afternoon we followed part of one the well-marked Camino trails linking the fishing village of Sanxenxo with Portonovo - the Sendeiros litorais de Sanxenxo. Another trail was signposted following a similar route, although I couldn’t tell which Camino it was from the sign. Our walk took us along the rocky coast to the village of Barbeito, where the trail crossed a sandy cove, up to the village of Paxarinas. I’d taken a rucksack in the hope of finding a little local store, but both villages clearly only come alive in the season. Both had lots of closed hotels, empty holiday apartments and caravan sites, but no shop. We can make do for a couple of days - although teabag stocks are getting critically low! - so I’ll go hunting again on Monday when I go out for a bike ride (tomorrow is a right off due to the forecast heavy rain). It was lovely to get out for a walk for a couple of hours after days stuck in the van. Back at the site, the washing was dry and after a brew I cooked some seafood tagliatelle. We bought the dried pasta in a vegetarian shop that also baked bread and vegan cakes, when we enjoyed our vegan lunch (we’re not vegans but we enjoy the food). The seafood was tinned clams and baby squid; the Spanish and Portuguese have a great selection of tinned seafood; their large tins of tuna are delicious. We’ll certainly be taking a few of them home, along with plenty of good Spanish olive oil. On the way back from our walk we could see the dark clouds forming out at sea and not long after we returned the rain started. It’s still going and it’s really chilly, so we’re staying in the warm van with a hot cup of tea. Tomorrow’s forecast is similar so it’ll probably be in ‘in day’ again! It’s time for me to do the monthly accounts and reconcile statements, so that’ll keep me quiet for a while. But the weather’s supposed to be improving for Monday and Tuesday, so we plan to stay here four nights to take advantage and explore the area a bit more on foot and bike. 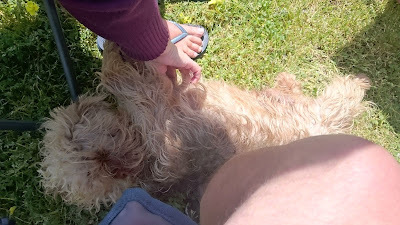 The campsite dog likes a bit of attention!